Oldham County Absolute Estate Auction — Harritt Group, Inc.
Cash, Check or Credit Card with 3% Convenience Fee. 6% Sales Tax (No Sales Tax on Titled Vehicles for KY Residents). 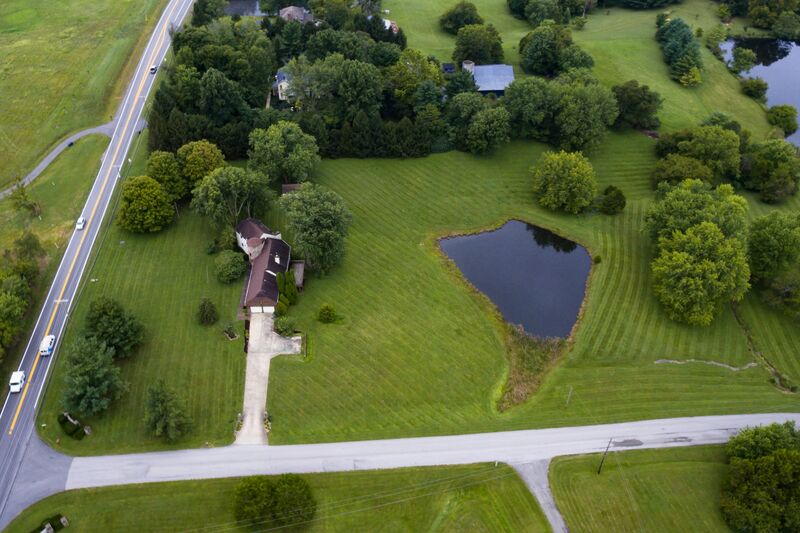 The Robert Seger Estate is offering at live absolute auction this spacious Crestwood home on a beautiful 5 plus acre lot with lake in Northwood Subdivision located 4 Miles SE of I-71 and just East of Ky-329. Nearly 2500 square feet on two floors plus 1000 square feet finished in walkout basement includes 4 bedrooms, 2.5 baths, fireplace plus attached 2 car garage. A rare chance to buy at your own price in historic Oldham County, Kentucky. Also selling a lifetime collection of personal property including 1998 Dodge Ram pickup truck, 2002 Buick Park Avenue, 1999 Honda Civic, Scag zero turn mower, John Deere 316 lawn tractor, lawn equipment, power yard & hand tools, sterling silver, jewelry, furniture and more. Brimming with country charm this gorgeous 5.11 acre tract is the perfect compliment to this unique 2,491 square foot Crestwood home. Enjoy a serene country setting with a lake, rolling countryside and mature trees while still being in the Northwood Subdivision close to dining, shopping and interstate access. The first floor includes a master suite with walk-in closet, full bath and adjoining office, an equipped kitchen, formal dining and living rooms, large wood deck off family room with stone fireplace, laundry room, half bath and a rotunda with a winding staircase to the second floor which includes three bedrooms and a full bath. The home also includes a large walkout basement with a 1,010 square feet finished that includes a great room, bar area, rough in for half bath and a 520 square foot unfinished storage area. This property features gas heat, central air, an attached two car garage and equipment storage shed with attic space. Improvements include Anderson replacement windows. This property needs renovation and is selling at absolute auction to the highest bidder with no minimum, do not miss this one of a kind buying opportunity! 1998 Dodge 1500 Quad Cab SLT pickup truck, with 25,863 miles, cloth interior, 5.9L V8 Magnum engine, VIN #1B7HC13Z0WJ206464, 1999 Honda Civic four door sedan with 198,614 miles, VIN# -1HGEJ8641XL060729, 2002 Buick Park Avenue four door sedan with 131,660 miles, 3.8L V6 MPI engine, leather interior, VIN# – 1G4CW54KX24198114. Scag Tiger Cub Zero Turn with Kawasaki 23HP engine and 52” deck mower, John Deere 316 riding lawn mower, Trac Vac lawn vacuum, utility lawn trailer, Snapper 415ORT push weed trimmer, pull behind lawn sprayers, lawn seeders, Husqvarna 625E Series 6.25HP push weed trimmer, Worx Aerocart 8-1 wheelbarrow, Toro GTS5 push lawn mower, STIHL FS-90 straight shaft weed trimmer, STIHL FS-110 straight shaft weed trimmer, STIHL FS-85 straight shaft weed trimmer, Homelite HT-17 gas powered hedge trimmer, Craftsman gas powered hedge trimmer, STIHL BG55 blower, STIHL HS45 hedge trimmer, STIHL MS250C chainsaw, Craftsman 18” chainsaw, Black and Decker battery powered handheld chainsaw, MoJack lawn mower jack, Pro 40 plastic edging and more. Complete contents of two car garage and detached shed includes an expansive tool collection highlights include Porter Cable air compressor, Craftsman Powermate generator, Bosch miter saw on collapsable and rolling table, Delta 10” band saw on collapsable and rolling table, saw horses, Black and Decker Workmate 425, Milwaukee sawzall, Black and Decker Mega Mouse sander, (4) Bostitch air nail and staple guns, Black and Decker router, Rotozip Revolution spiral saw, Surebonder 9600A staple gun, Arrow electric staple gun, Skilcraft air staple gun, air impact wrench set, Chicago impact wrench, Central Hydraulic 2 Ton engine hoist, large aluminum extension ladder, 17’ aluminum folding extension ladder, several aluminum folding ladders, wood folding ladder, stainless steel ATV ramps, Mercury 5.0 boat engine, 48” farm jack, large selection of hand, yard and power tools, extendable Remington 10’ pole saw, 3 gallon air compressor, Craftsman Utility Sharpener, Chicago 2000 LB electric winch, large selection of speciality tools including electric, carpentry, drywall and more, dozens of hand and yard tools, hundreds of feet of heavy duty electric extension cords, heavy duty air hoses, massive collection of assorted hardware and much much more to be discovered. (2) large Sentry storage safes. 112-piece Wallace sterling silver flatware set with 12-place settings including (12) sterling handle dinner knives, (12) dinner forks, (18) salad forks, (12) soup spoons, (19) spoons, (12) sterling handle butter knives, (14) shellfish forks, (4) large spoons, (4) assorted serving spoons, (1) slotted spoon, (2) serving forks and (1) cake serving knife. Weight 119.095 troy ounces without knives. Knives weigh 52.02 ounces. Vintage Omega Constellation “pie pan” automatic chronometer swiss made watch – in running condition, (8) ladies movement watches, Waltham pocket watch, Elgin pocket watch, (10+) quartz watches, (15) 14K and 10K gold rings, 14K gold bracelet, (6) gold and sterling silver necklaces, brooches & diaper pins, large selection of costume jewelry including necklaces, rings, earrings and brooches. Beer steins, vases, several duck figurines, Federal Aviation Agency pins and patches, vintage lighters, belt buckles, tie clips, graduated Pyrex bowl set, vintage Corningware dishes, Corral Ware, Canon and Nikon binoculars, vintage Coleman camp gear including a lantern in original box and a propane camp stove, Bushnell scope and tripod, military canteen and mess kit, USMC knife, Russian military hat, bookends, large selection of china and collectible glassware, decorative bird houses, large selection of collectible books including several cookbooks, dozens of dolls, vintage Atari games, board games and much much more. Kimball piano, ratan style dining table & chairs, asian design china hutch, mission style cabinet, (2) cedar chests, bedroom furniture, patio furniture, reclining cloth sofa, cloth recliners and more. I-71 to Crestwood Exit #14. North 2 miles on Hwy. 329 Veterans Memorial Parkway to left on State Hwy. 22. West 2 miles to left on Northwood Drive to auction.